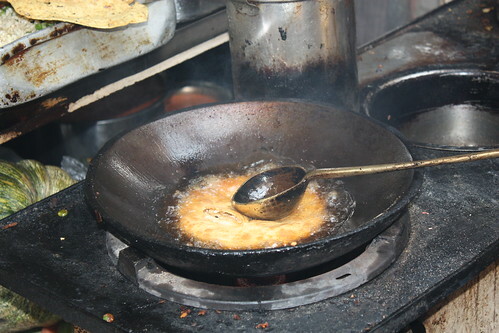 To add one more item to my “Been There, Done that” list, this weekend I covered most famous part of food capital of India, the Chandni Chowk. After Delhi Metro’s arrival to this most famous and oldest place in Delhi, It has become much easier for anybody to come here. So I also took the same to reach here from Gurgaon (taken metro from Dwarka station) . As soon as you enter Chandni Chowk streets, you feel like its a different world (specially if you are coming from city of malls). This place is a mixture of religion, food, chaos, history, modernity, tradition and commerce. People moving fast here and there in narrow lanes. On every corner you will find something special to eat. Most of the shops in Chandni Chowk are handed over from father to son, most of them now being managed by the fourth or fifth generations. There are examples of halwais, namkeenwalahs, paranthewalahs and many others. Every shop has its own specialty. 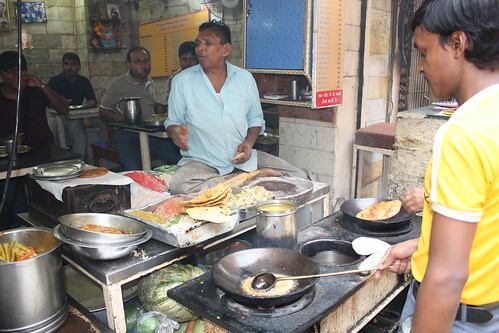 We decided to start our day with famous paranthas from Gali Paranthe Wali (गली पराँठेवाली). Some 50-60 years back there were around 15-20 shops in this street, but now only 4-5 have left. 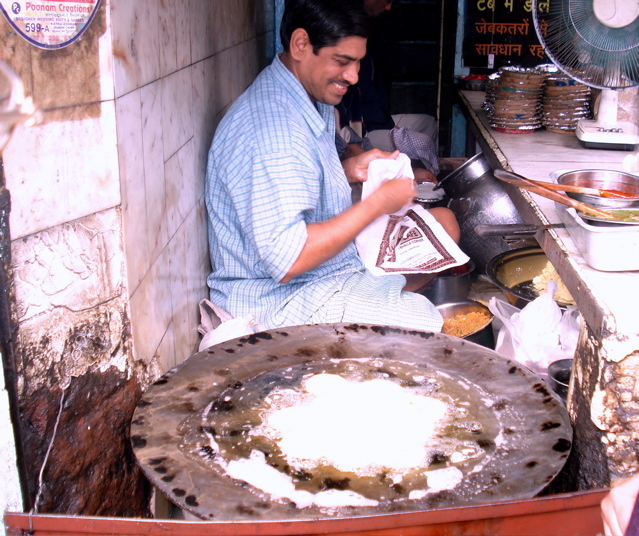 The first parantha shop in the gali is Pandit Devi Dayal’s (established in 1886). 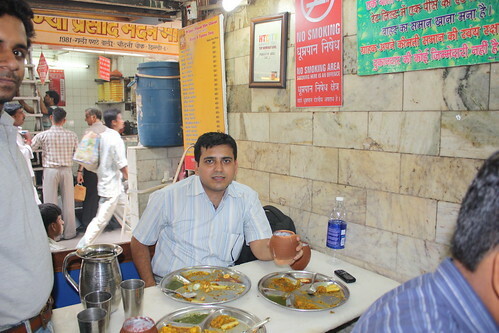 Then the next one is Kanhaiya Lal Durga Prasad’s Parantha Shop (established in 1875). The last one was Pt. Gaya Prasad Shiv Charan (established in 1872). As we found last one as the oldest shop, we decided to move into this one. All of these shops had photographs on the wall that showed Nehru, Indira Gandhi or Ranbir Kapoor dining in the shop. 50 years back the paranthas were just of 3-4 types aloo, gobi and matar (potato, cauliflower and peas). 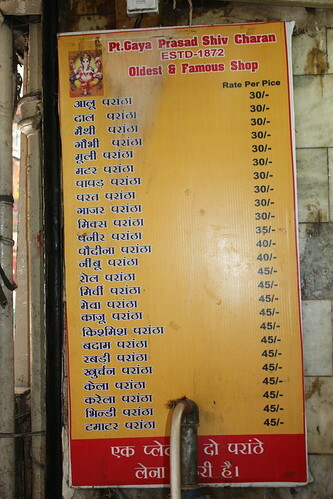 But now-a-days, you can try 24-25 varieties of paranthas. Apart from normal aloo, daal, methi, gobhi etc, there were special paranthas like papad, parat, gajar, kaju, rabri paranthas. 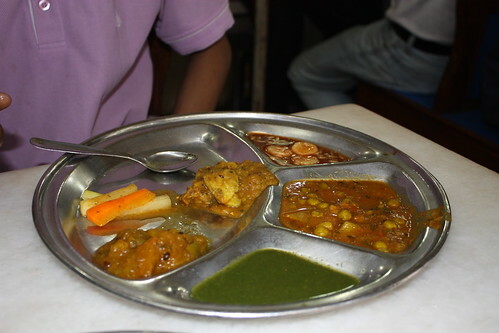 All paranthas are served with Mint-Pudina Chatni, Banana Imli Chatni, vegetable pickle and Aloo Subzi. We could only try Karela, Kela, Gobhi and Tamatar Parantha (due to limited size of stomach :)).Hopefully we will try more in next visit to Chandni Chowk. Another good part was malai wali Lassi. 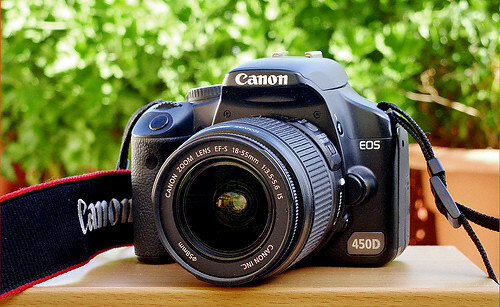 Another motive to come to Chandni chowk was to buy accessories for my newly bought Digital SLR (Canon EOS 450D- Digital Rebel XSi). Only few people know that within the Chandni Chowk, there is Asia’s biggest camera market. Photo market on the Esplanade Road has some hundreds of small shops offering various ranges of latest still/video cameras and accessories. This is wholesale market and most professional photographers (from wedding photographers to new channel guys) come here to buy albums, lenses, filters, tripods, battery and camera bags etc. One of the oldest shop is Pritam Studio (owned by a sardarji), has customers from all over india for camera repair. Good thing about this market is you will get all sort of qualities and all at a genuine price. There is no bargaining and every shop sells at a good price. I bought Kenko UV filter, camera bag, lens cleaning kit for my SLR and a bag for my Sony Tripod. 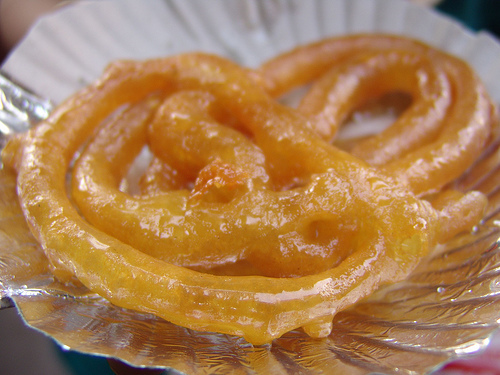 After shopping for the camera, we found one of the other famous shop in Chandni Chowk, Jalebi Wala. Although stomach was full, I could not resist buying a small portion just to taste it. This reminded me the old Doordarshan TV advertisement. Finally before starting back to home, we decided to try another Chandni Chowk special, Natraj’s Dahi Bhalle. 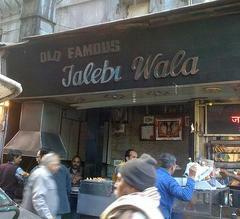 Shop was established in 1940 and since then it has become one of the most famous street food shop in Delhi. It sells only aloo-tikki and dahi bhalle on the ground floor. The dish lived up to its reputation and best ingredient in dahi bhalla was saunth (tamarind chutney), tangy and slightly sweet. Another interesting thing you will see near Natraj shop is pedestrian jam in narrow street connecting to Delhi metro way. You must have seen traffic jam on roads, but this was jam of pedestrians 🙂 This was busiest and most narrow alley you will ever notice. So we called it a day and started back to Dwarka Station through Delhi Metro.